Fish below Reddings Famous "Sundial Bridge"
The Sacramento River at Redding's "Sundial Bridge" is one of California's best wild rainbow trout fisheries. It is also our most popular guide destination. 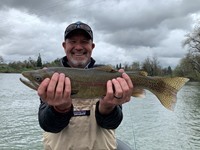 Confluence Outfitters guides are out on the "Lower Sac" daily and many of our drift boat trips take our guests right below the Sundial Bridge. 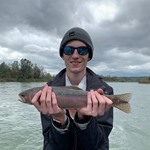 This is a great destination for all skill levels and is our most popular trip for beginner fly fishers. First-time fly fishers have an excellent chance of landing wild rainbow trout and our guides are great with beginers. We offer full day trips for $450, shuttle-included trips for $495, half-days with lunch for $350, and half-days without lunch for $325. All trips are float trips in drift boats and the price is the same for 1 or 2 guests. All equipment is provided on all trips. You only need to bring your license and steelhead card. All full day trips include lunch. The shuttle-included trips are very popular because your guide can meet you right at your hotel and you don't need to use your vehicle at all. The river is open to fishing year-round beginning one mile downstream from the Sundial Bridge. The section immediately below the bridge is open from August 1st through March 31st. For more information, please view our Lower Sacramento River page. 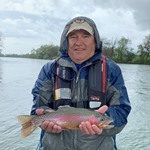 Visit our Lower Sac Fishing Report page to view more reports! For more Lower Sac dates, please visit our Online Booking page! Please visit our Redding page for hotel and restaurant recommendations and ideas about other things to see and do while you're in Redding!